Like any complex piece of machinery, your automatic gate system can break down due to various reasons. When this happens it’s important to get it fixed as soon as possible; it can make getting into and out of your home or work extremely inconvenient. Luckily for you, our technicians are ready and willing to come and fix whatever's causing your gate to misbehave. Gate systems are complex machines, and there are many different things that can go wrong with them. Our team can handle any problem, including hinges that require some welding repair, opener malfunctions that prevent the gate from opening and issues with the intercom system that make it impossible for you to communicate with visitors. We know how important it is to fix the root cause of a problem in order to prevent it from repeating, so our team will make sure they address any underlying issues as well, not just the symptoms. In some cases, your gate could develop more problems than you may be aware of, especially if it hasn’t been regularly maintained. When carrying out repairs, our team is always on the lookout for signs of damage to other components, not just the ones they are fixing. If we spot anything, we’ll make sure you are aware of the best course of action that needs to be taken. When a gate system breaks down it’s often necessary to replace broken or worn out parts, seeing as trying to repair them may be more costly, or even – in some cases – impossible. Our team will assess the condition of any components that show signs of wear, and install a new one in its place, whether it's the track, the sensors or even the entire opener. 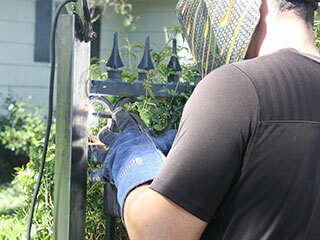 We work hard to provide our local customers with top-quality gate repair services. If you need something solved quickly and effectively, contact our team at Garage Door Repair Sherman Oaks today.